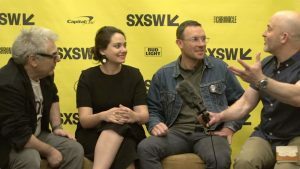 I met with directors Cristina Costantini and Darren Foster on Sunday, March 13, at the 2018 SXSW Film Festival, with my Fog of Truth podcast colleague Bart Weiss (of Dallas VideoFest) joining me for the conversation (in fact, we used this interview in the first episode–201–of our 2nd season, available on iTunes, SoundCloud and Stitcher), to discuss Science Fair, their award-winning crowd-pleaser of a documentary (which I also reviewed). 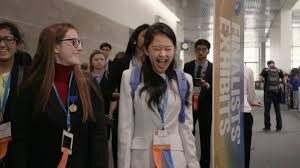 In the movie, Costantini and Foster explores the joy of creativity and innovation, following different high-school-age subjects as they prepare, in 2017, to compete in the annual International Science and Engineering Fair (ISEF). With engaging characters – from around the world and from a variety of ethnic and socio-economic backgrounds – and a proud pro-education and pro-immigrant message, the film is a slap in the face to the forces of ignorance and intolerance whose voices have, of late, been all too loud. It’s also extremely entertaining. Here is a condensed digest of our conversation, edited for length and clarity. Hammer to Nail: So, how did you decide on which participants to follow? One of the things I was curious about was how you’ve got a team from Brazil, you’ve got this guy in Germany…without giving away any plot spoilers, some people are obvious choices. You have this interesting mix, but you could have easily chosen different people. How did you choose who would be in your movie? CC: And Kashfia is the only Muslim girl – or one of the only Muslim girls – in her huge high school in South Dakota, and she had no support for Science Fair, and when we found out that the Head Football Coach of the school was her Science Fair mentor, that was, for us, the deciding factor. Bart Weiss: She is such a great character, and the idea that her coach doesn’t know very much about science, at all…and then you have other places where their teachers are pushing them, and knowledgeable…it really sort of speaks to the complete range that you have in the film, but also the complete range of people who are obsessed with science, which I think is the real message of your film. HtN: Indeed, and one question I had was this: once the results of the Science Fair were clear, did you then go back and film supporting footage, as I imagine you did, with the winner, to support his narrative? CC: We watched that a lot of times, and if you watch it again, you can see that they did the same thing: they went back and followed the winners, and so that was our plan, all along. It turns out the winner was very interesting and different from the rest of our characters, so it worked out. DF: But that was the only character that we reverse-engineered. BW: And what did you wear? CC: (laughs) Good question. It was probably some pant suit or something not cool. But that was very important to me, to capture the teenageness of the Science Fair because, when I went through it, I was enthralled by this idea that you have some of the smartest kids in the world, and then they’re all forced into the least Science Fair-ish environment, basically like a European rave. (laughs) And they all have to be teenagers, and that was central to the heart of our movie: these kids are geniuses, but they’re also awkward teenagers. HtN: And speaking of that, I thought those three bros from Kentucky were perfect casting, because if anyone had preconceived notions of what science nerds are about, and I use that term – which they appropriate in the film – in a positive way … they’re the antithesis of that, particularly the blond surfer dude, or rather the guy his friends say looks like a blond surfer dude. So, you had this amazing range of types of young scientists that I really appreciated. DF: Yeah, I mean it was really important for us to portray these people – these kids – as three-dimensional characters, and in many ways they play against the stereotype of what a “nerd” is. So, yeah, the Kentucky boys are a great illustration of that, but they all, while very intelligent, are all very well-rounded and have interests that go beyond science, from music to art. So, this idea that you’re either left-brained or right-brained, or you’re either into hard science or you’re into creative spaces is a bit of an outdated idea. These students bridge that gap really well. HtN: I think this film very much makes the case for the idea of STEAM vs. pure STEM education, adding the “A” for “Arts,” and showing them as well-rounded, and I do think it takes the word “nerd” and makes it something to be proud of, as it should be, right? It does a great job with that. BW: I think nerds have gotten a better deal in the last 5 or 6 years…One of the things I think the film really points to is the value of science, and there’s a sense that we don’t have the same place, in terms of technology, than we did 10 years ago. For as long as I’ve been alive, we’ve thought that Americans can figure out how to do things, and I don’t think we feel that way anymore. This film gives us a sense of possible hope, but these kids are all rare in their own communities. So, what is this film really saying about the role of technology in our life now? CC: Well, I think one of the ideas that we wanted to get across was something that the Brazilian doctor says, which is that a good idea can come from anywhere, but it’s really up to us to make sure that the good ideas are supported. You see in Germany how all the German kids, when we were there, are incredibly supported, but there are places in the United States now that are not helping move some of our most brilliant minds into positions where they can do brilliant things. So, for us, we wanted to make that point that we need to be supporting these kids, and the United States is not always the best at doing it, anymore. DF: I mean, I think Germany has made it a national priority to find and identify these kids and to really take science seriously as part of the future foundation of that country. And I think there is a bit of a vacuum in the national leadership, here in the U.S., just sort of setting the tone that you will be appreciated for science. And you see that at the local level to a degree, too, where you see people like Kashfia who don’t get the respect, or the love, for the amazing work they’re doing, you know, placing third in their category at the International Science Fair and not getting even a simple announcement at the school, whereas the losing football team is hailed as heroes…so, it’s about priorities, I think. HtN: And your film doesn’t just support the notion of science education, but also the idea of how much this country benefits from immigration, which is another topic where we have, not a vacuum of leadership right now, but negative leadership. Your film demonstrates why both those things are so terrible if we continue down that path. CC: Yeah! I think that was very personal for both of us. My father is an immigrant. Darren is married to an immigrant and I think we both believe that we won’t be the same country if we don’t make sure that people can come here. DF: Yeah, I don’t think you could do a science story in America, even if you go back generations – hundreds of years – without having immigration be a very important contributor to the research that’s been done. BW: All right, so I have to ask you: what was your thing at the Science Fair, in just one minute? CC: OK, so mine was on behavioral science. It was about social conformity, and I developed a test that measured individual susceptibility to peer pressure in teenagers. So, I thought I wanted to study people, and then I just realized I wanted to be a filmmaker. I’m just interested in people. So, I gave up science. Darren was also a scientist. He majored in biology. So, we both sort of have science backgrounds. HtN: And that probably helps inform some of the questions you ask and decisions you made, because you had background in the area. BW: But you have to get to the point where it’s more than general, because you have to see the passion in them, but you don’t want to bore them. Indeed, that’s the same problem with having the board at the actual presentation. How long do you have to tell your theory … (turning to Cristina) … like you did in a minute, thank you very much … (Cristina laughs) … but, I don’t see those board things as being great ways to tell your story. It seems very 19th century, to me. BW: And show me the thing! It seems so antiquated. HtN: I think future Science Fairs should an R2D2 bot that comes out and projects a hologram. But that is, I think, the standard way. BW: That’s the way it’s always been, right? HtN: So, how did you two meet and decide to collaborate on this film? BW: And in the making of that, you got to see the world in a completely different way. I mean, there was a whole lot of travel, and meeting all these people in these different places. I mean, the experience of making the film had to be really exciting. CC: Usually, when we make a film, we’re going to somebody’s home to talk about some very sad thing, or going to a town to talk about some very sad crisis, but it was amazing to go to this tiny, tint town in Brazil, for example, and talk to everybody about their celebrated Science Fair champions. It’s like a totally different experience, to talk to people about things they’re very proud of. It was a lot of fun. HtN: I love how you open the film with Jack Andraka, just because his sheer joy at winning is infectious, and as soon as I saw that, I was in. Your movie had me … “at hello” … (everyone laughs) … I mean, that footage, which is, of course, archival, is amazing: that pure bliss at winning. How did you decide to open with him? CC: That was one of the first things that sold the project, right? CC: And that’s what got people into the project, because explaining how wonderful Science Fair is, is one thing, but seeing Jack’s face during his win … I think you get it, immediately. So, from the very beginning, this was the heart of the film, and we knew we wanted to open with it. DF: It was the first piece of video Cristina showed me to show me what the International Science Fair was about. And I think that moment encapsulates the sheer passion that some of these kids have for science. And so, basically, we were just going to interview Jack about just re-creating that moment for us, but then he just wound up being such a great narrator for other aspects of the film, too. He was in that sweet spot where he had a bit of perspective, because he’s a bit older now, but he’s still young enough that he remembers it so passionately. So, he was just able to talk us through these other moments in the process that were really crucial. BW: He’s a great person to bring you into the story. HtN: Well, I really love the film. Thank you so much for joining us!